Saffron Yellow - Journey of a Crafting Mama: Crafting Space Makover!! Yes, it was time... This used to be the darkest spot of our home and I felt so ashamed when vistors lurked through the curtains. So after two years of feeling too worn out and tired to do anything to make this space usable a sunny saturday gave me the force to begin what was a herculean task. This is actually not the realy "before" picture, because piles of books and mags have already been taken out, plus a sewing machine and a huge spinning wheel! So I cleared the space completely and wiped the winter garden from floor to top. It took me hours. Then I finally took care of this small dresser, which was standing abandoned on the street. It had be sitting in the basement for years waiting to be loved again. Initially I thought of spraypaintng it. But it turned out very ugly, probably because I had no idea for what size of surface the tin would be sufficient for. Luckily I found a leftover of white acrylic paint that had to do the job (it was sunday, all shops closed). So next time, insted of wasting a tin of spraypaint I should invest on new acrylic paint. But finally I like the outcome, with distressed edges for some shabby chic. The beads and supplies are all neatly organized in screw top jars or translucent boxes. 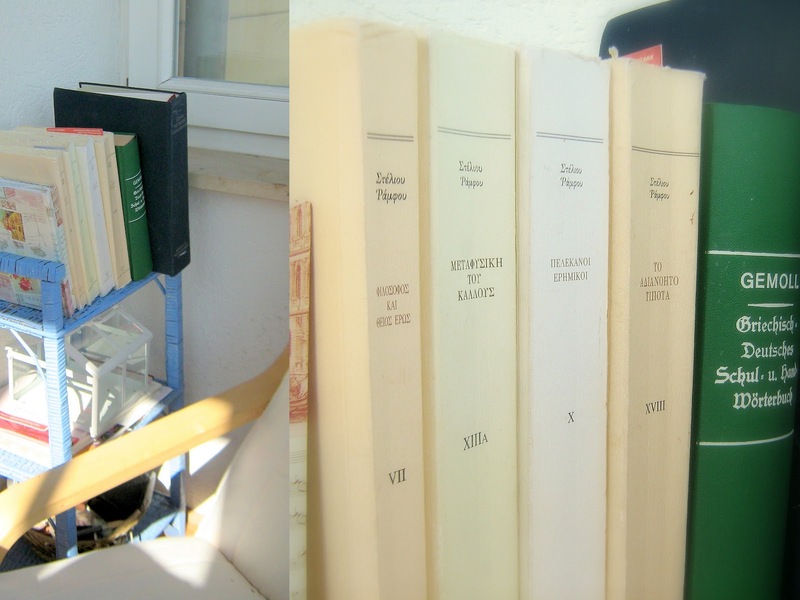 The shelves used to carry the ever-growing piles of books in my student appartement - now they have a new life. How did you (re-)arrange your creativity space? I'd love to see it!